BVP is a finger-worn blood volume pulse sensor (or PPG sensor). It provides the BVP waveform, for heart rate, BVP amplitude, and Heart rate variability. 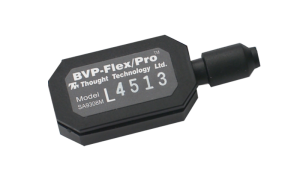 The HR/BVP sensor is a blood volume pulse (BVP) detection sensor (also known as a photoplethysmography – PPG – sensor) housed in a small finger worn package, to measure heart rate (HR) and provide BVP amplitude, BVP waveform, HR and heart rate variability (HRV) feedback. Place the sensor against the fleshy part of the first joint of any finger. The middle finger is recommended for better compatibility with the other sensors when they are all placed on the same hand. Note: Place the sensor label up, so that the electronic sensor components (the two small square openings) on the back of the sensor (not shown) are against the finger. As an alternative, Coban (3M) self-adhesive tape can be used to provide a more secure fit attachment.